Sudogawa Valley (須津川渓谷) is located in Ashitaka mountains, Shizuoka. It is popular hiking spot around the southern Mt. Fuji. There is beautiful waterfalls called Odana Falls. 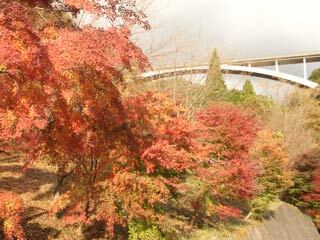 Koyo, the autumn leaves in Sudogawa Valley is beautiful and popular. Many hikers visit here and enjoy beautiful nature. Sudogawakeikoku Bridge is another feature of this valley. You can have great arial view of the valley and Suruga Bay. There is a camping spot at the entrance of the hiking courses.